Spam filter companies use “spamtraps” to catch samples of spam for analysis so filters can be updated. We do this here as well. Most types of spam are already caught by our spam traps, however sometimes people get lots of spam which gets through the filter because their particular type of spam does not currently get sent to our spam traps. If you want to help you can do this by having your VPOP3 automatically forward mail for unrecognised (or specific unused) email addresses at your domain to our spamtrap. 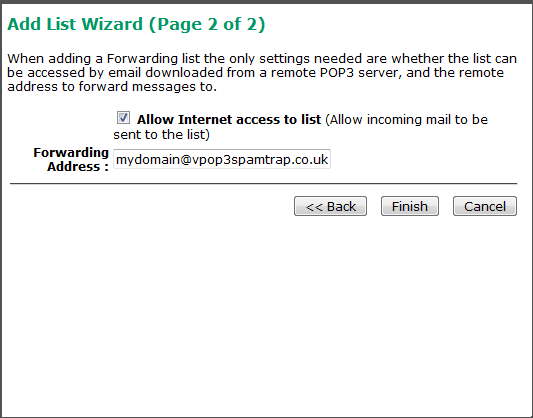 To do this, create a Forwarding List in VPOP3 called 'spamtrap' and set it to forward the mail to '<yourdomain>@vpop3spamtrap.co.uk'. To do this, go to the Lists page in the VPOP3 settings, and press New, the follow the screenshots below. 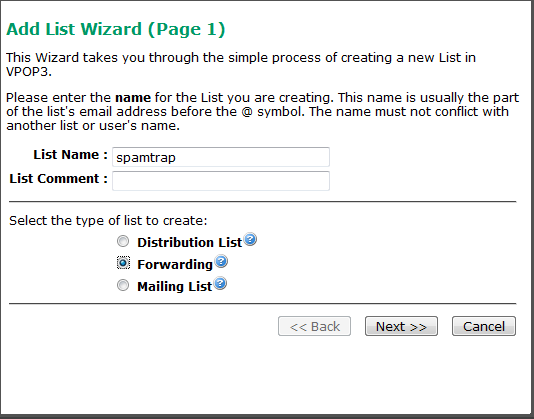 Then, go to Mappings and add mappings to send mail for unrecognised users or the specified addresses to the 'spamtrap' list. To send mail for unrecognised users use a mapping like ~@yourdomain.com → spamtrap. Otherwise use a mapping like unused.user@yourdomain.com → spamtrap.